Extensive selection of markings, well researched. 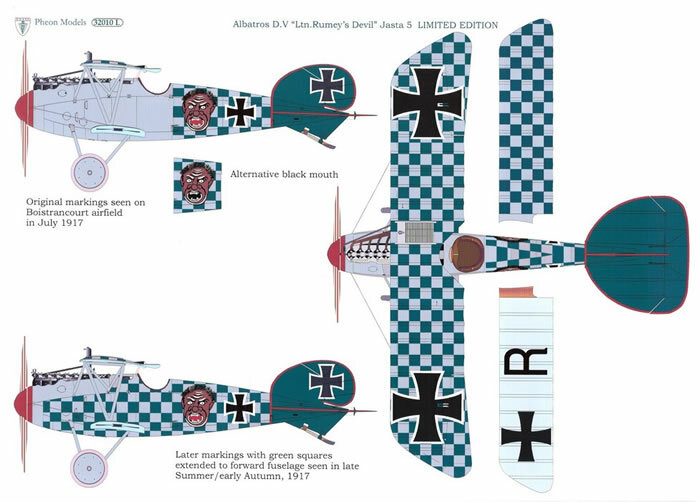 Beautiful rendition of the individual markings for Rumey’s and Wolf’s Albatros. The 1/32 scale Wingnut Wings Albatros kit is superb: beautifully detailed, accurate and easy to build - even in 1/32 scale the finished model is not particularly large and many modellers will have room for more than one in their collections, so interest in after-market decals will be great. 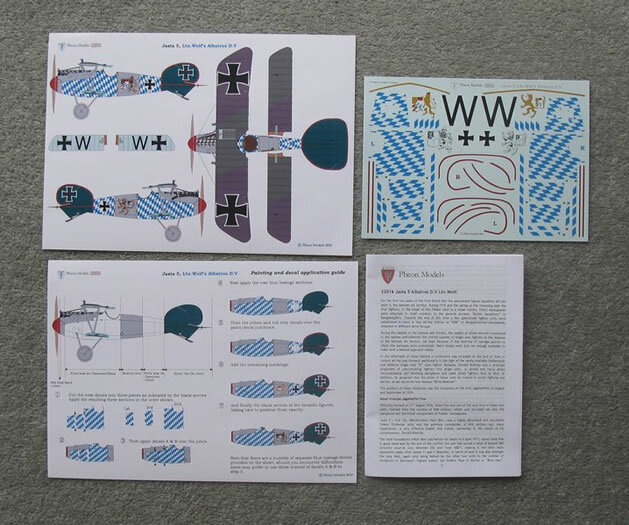 Pheon have already produced two sets of Albatros decals for the WNW kit, with nineteen markings options. So what do these four new sets offer? 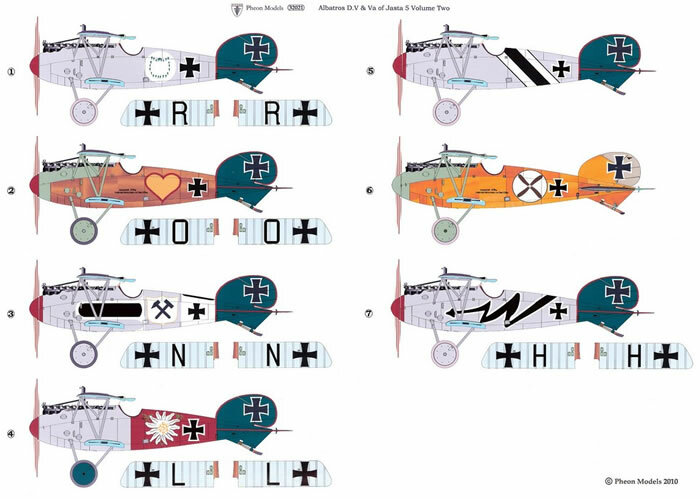 Sixteen more options, all from Jasta 5 (one of the elite German Jastas) and an even greater variety of colourful, interesting markings. 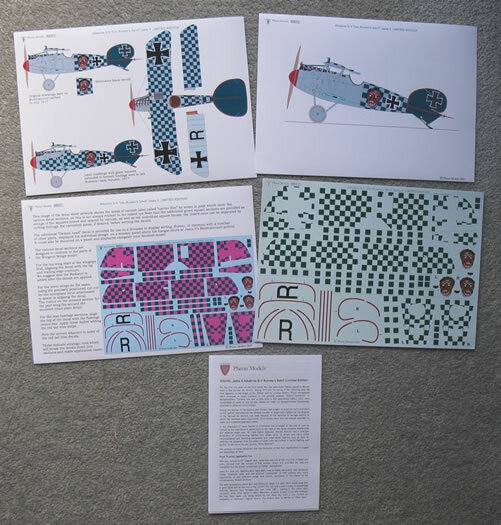 Pheon have based the Jasta 5 decal designs principally on the extensive research by Dr Glenn Merrill which was published in a two volume Datafile Special by Albatros Publications (and which is still in print). I can thoroughly recommend these two Datafiles, a very readable and well illustrated work. Jasta 5’s total score of approximately 260 victories ranks it the third highest scoring German fighter unit (Jasta) behind Jasta 2 Boelcke and Jasta 11. 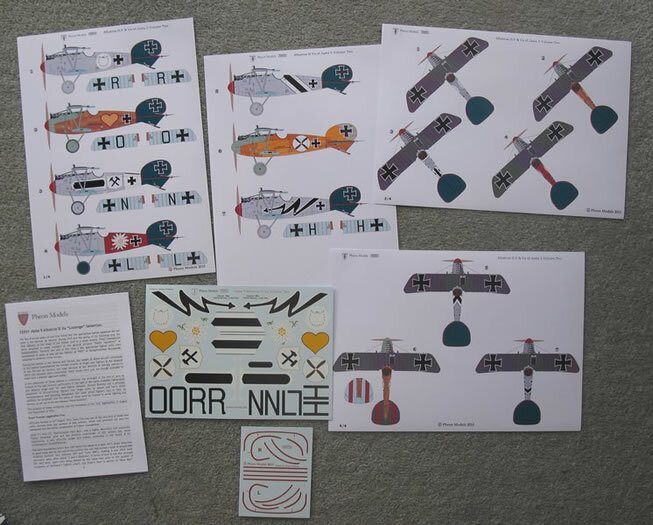 The unit is also interesting for the modeller due to the very colourful personal markings in use from about July 1917 onwards, comprehensively documented by an official photographer. As Dr G K Merrill states in the Datafile Special “for sheer execution of elaborate markings the Jasta 5 painter (probably with lots of assistance ) was without compare and we must thank this anonymous artist for so enriching the lore of aviation history”. This aircraft is one of my personal favourites so I was excited to see it released by Pheon. Ltn Fritz Rumey was Jasta 5’s highest scorer with a final tally of 45 victories, which also made him sixth in the entire list of the German Air Service in WWI. He was killed on 27 Sep-18 when his parachute failed to open correctly following a collision between his Fokker DVII and an SE5a flown by Captain G.E.B. Lawson of 32 Squadron. Pheon’s design of the markings follows Dr Merrill’s research closely. The origins of the snarling head are not known. Josef Mai, another Jasta 5 ace who survived the war, referred to it as a ‘devil’ and as an ‘African Head’ at different times after the war. 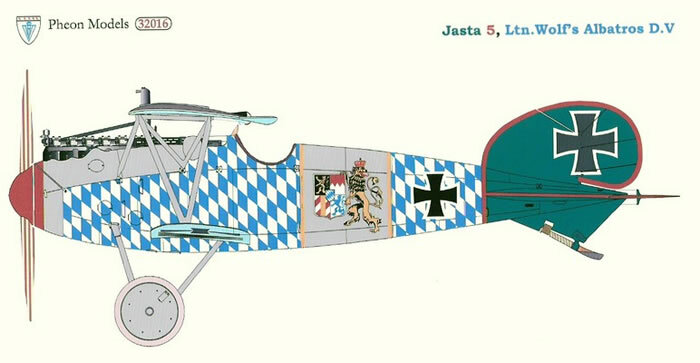 The colours of the chequered markings are not known for certain but Dr Merrill’s reasoned guess is Jasta 5 green painted over light grey which was also in use as a base colour by the Jasta). Personally I feel the photographic evidence argues against a pale grey for the base colour of this aircraft. 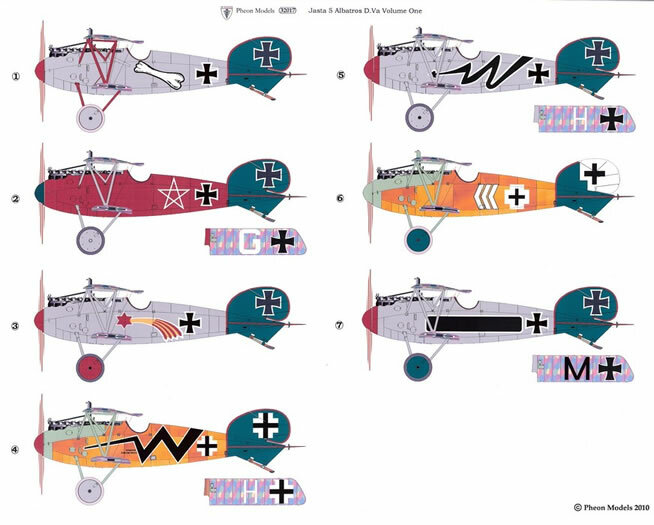 Looking at the famous 1917 Boistrancourt lineup photos in the Datafile Special Volume 1, Rumey’s aircraft is next to two other Albatros with the pale grey base, and it is noticeably darker than these. If this interpretation is correct it would leave the choice of base colour quite open, maybe a darker grey, maybe red who knows? 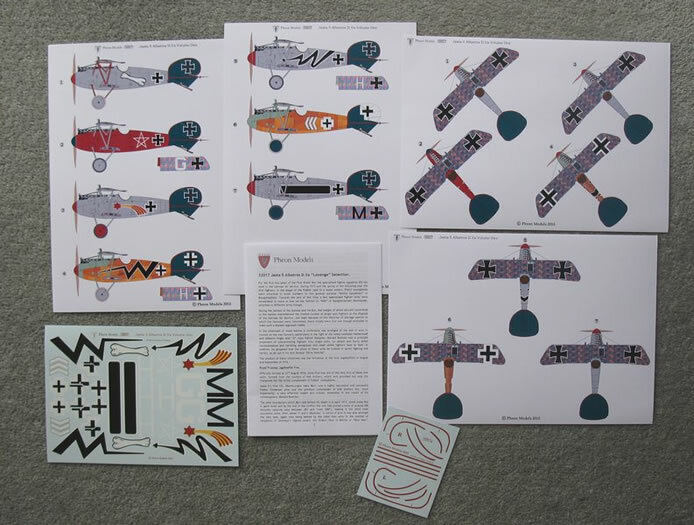 The decals fill an A4 sheet and include red edging for the tailplane. The chequers are in the green colour leaving the modeller to paint the grey base (or whatever colour you prefer) and the aircraft can be completed either with the whole fuselage in chequers (late version) or just the rear part of the fuselage in chequers (early version). For ease of application the chequers are split into sections and extra single chequers are included in case any patching is needed. A full application guide with step by step instructions is provided. Readers should note that it is a Limited Edition of 100 sets and that there are only 20 or so remaining at the time of writing. Pheon have stated it will not be re-printed again in 32nd scale. Early bird and all that. 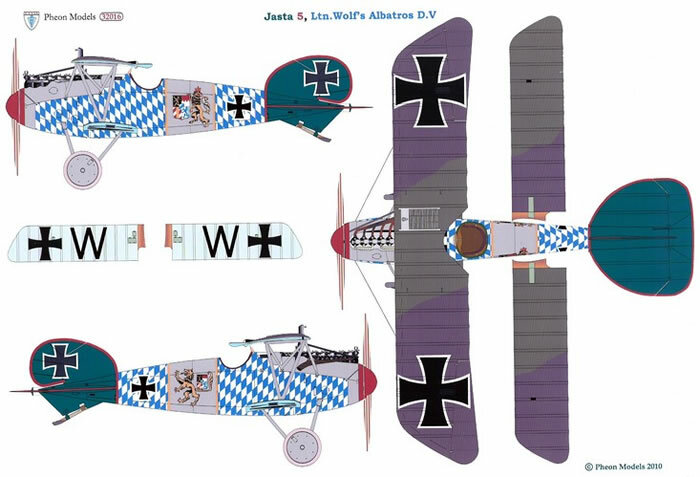 Wolf’s Albatros is one of the most strikingly marked aircraft to be found anywhere, but relatively little is known of the pilot and as far as is known, there are no individual photos of the aircraft. Pheon have elected to mirror the orientation of the blue and white diamonds on each fuselage side with a consequent break in the pattern along the fuselage centre line. As the fuselage tapers continuously, a ‘wrap around’ orientation would have been very difficult (impossible?) to achieve without the diamonds becoming much smaller towards the tail. The decals are on an A5 size sheet with the diamonds are set out in multiple pieces for easier application. Although a detailed guide is provided with step by step instructions, I suspect this set will not be suitable for the beginner. A number of individual blue diamonds are also included should any ‘patching’ be required. I really liked the two heraldic figures: the lion is typical of the Bavarian coat of arms and Pheon have exercised some artistic license to interpret the wolf in a similar style (as opposed to the rather crude figure in the Datafile). These are beautifully executed with base colours printed separately from the fine black outline, which is to be laid over the top. Red edging decals for the tailplane are included. This set is stunning and will show off the Wingnut Wings kit to full advantage. Josef Mai’s ‘bone’ Albatros which was fitted temorarily with experimental Siemens-Schukert rapid-firing machine guns (along with one of Rumey’s wound ribbon D.V’s). Obviously these will all require lozenge decals to be purchased separately. Pheon have lozenge decals currently in development and they are due to be released soon. Wilhem Lehman’s edelweiss on red fuselage (not to be confused with Paul Baumer’s similarly marked D.V. National markings are not included as those included in the kit are excellent. The separate set of red tail trim shown is also included in 32021 (and available separately as 32017a at £2.00 for those who wish to build more than one model from either #32017 or #32021 sets). Early versions of the instruction booklets for all these sets had a typing mistake in the recommended Citadel paint colours: ‘Regal Red’ should be ‘Blood Red’. Pheon have indicated that all these plus some other Jasta 5 subjects will be made available in 72nd and 48th scales in the next couple of months. All the marking options are featured in full colour on A4 sized sheets of glossy photo paper showing decal placements (side profiles and top views). The Jasta 5 green colour on the review sheets has come out rather more ‘teal’ coloured than the green from the Datafile. Notwithstanding this minor point, the artwork is very nicely done. All the markings in these sets offer colourful and interesting alternatives to set your Wingnut Wings Albatros apart. The sets for Fritz Rumey and Ltn Wolf are particularly stunning.